Maschine 1.5 emulates more classic drum machines. PRESS RELEASE: Native Instruments today released MASCHINE 1.5, a major free update that significantly increases the functionality and creative potential of the acclaimed computer-based music production system. With more classic drum machine features, improved host integration, new sampling functions, an extended sound library, and even more efficient workflow, the 1.5 software expands on the concept of MASCHINE as the most integrated and intuitive groove production studio for producers, live musicians and DJs. To bring even more of the legacy of classic drum machines into the modern music production environment, MASCHINE 1.5 introduces two new "vintage sampler" modes that authentically emulate the gritty sonic signatures of the popular MPC-60 and SP-1200 models through sophisticated component modeling. The 1.5 version also loads the programs of nearly all MPC models ever built, opening up a vast resource of existing sound and sample material within MASCHINE. MASCHINE 1.5 also enables a new and highly efficient level of DAW integration, with convenient host automation through new macro controls, MIDI pattern Drag&Drop export, direct DAW recording of MASCHINE events, MIDI pitch bend and CC support, and more. The powerful real-time sampling features of MASCHINE benefit from extended slicing and mapping options that make it even easier to work with sampled grooves and other rhythmic loops. The 1.5 version also introduces a full arsenal of destructive audio editing functions for in-depth sample manipulation. The MASCHINE 1.5 update includes a versatile assortment of additional instrument and drum sounds, based on a gigabyte of high-quality sample material. The library has been expanded with special versions of ABBEY ROAD 60s & 70s DRUMs, authentic electric pianos and bass guitars from Scarbee, contemporary acoustic strings taken from the upcoming SESSION STRINGS instrument, sampled vintage analog synths, and carefully resampled MPC-60 hip hop kits from sample expert Goldbaby. Further enhancements in MASCHINE 1.5 include a new "Grain Stretch"
effect algorithm, a "16 Velocity Levels" pad mode, MIDI file export, extended polyphony options, improved event editing and navigation on the controller, project default templates, sample consolidation for improved song portability, and a wide range of minor optimizations. The 1.5 update is available as a free download for all owners of MASCHINE. 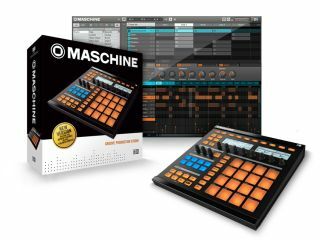 The release of MASCHINE 1.5 is also accompanied by a four-part feature demonstration, as well as an interview series featuring producers like No I.D., Jurassic 5 member DJ Nu-Mark, Dawaun Parker, Brook D'Leau and Needlz.